It is not often that I can tell a whole album is going to be special from just the first minute of an opening track. This was one of those times. The foreboding heavy bassline; the ethnically inspired lead guitar; the spacey atmosphere creeping away in the background. Everything just screams: “you are not ready for what’s to come”. And that’s when the first heavy stroke of the guitar hits you, as the track is properly set off with such a headbang-inducing force that it’s very hard to not to let out an impressed smile. The track then develops into the first passage, which really reminds me of “Crack the Skye”-era Mastodon — a sound that returns several times throughout the record. This is much to my enjoyment, seeing how big of a fan I am of that specific sound (and how I wish Mastodon would return to it). "The Crimson Path” not only stands as a thoroughly engaging start to the album but also encapsulates what Dvne’s newest triumph of an album is all about: pummelling sludge riffs and progressive compositions intertwined with beautiful melodies and atmosphere. Hailing from Scotland, Dvne is one of those bands that you cannot believe you have not heard of before. Sure enough, I was almost half a year late to the party, only learning of this album by the end of 2017 after its release in July. I simply do not understand why these guys have not blown up yet. The craftsmanship behind the album is so professional; it sounds and looks like a veteran progressive band, yet they only just formed five years ago. 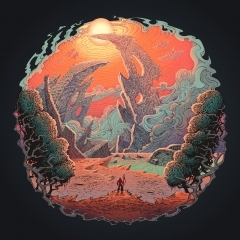 The beautiful cover art, showcasing a lone hunter on a desolate, far-away planet matches the general scope and theme of the album perfectly. The production sounds crisp and modern yet still retains its dynamics and that signature filthy guitar sound you would hear from bands such as Elder or Conan. Everything about the package is impressive to say the least. Following “The Crimson Path”, the second track, “Viridian Bloom”, is another straight progressive stroke of genius. The intro is one of the first times we hear how well this band can pull off more laid back progressive sounds, contrasted with the heaviness they also bring in force. Acoustic guitars and delay-infused leads set the landscape in the first couple of minutes. But don't be fooled by the mellow intro. This track in particular has one of the heavier moments on the album in the form of a middle section with one of my favourite riffs of 2017. This part also introduces unclean vocals that remind me of the low pitched shouts you hear in a lot of post-metal. After a small interlude, which sounds like floating around in deep space, the third track “Thirst" kicks in. “Thirst” is no exception in regards to surprising and impressive sounds as this track presents no less than eight minutes of both black metal-sounding minor riffs and drums, doomy melancholy and those sweet Mastodon-style riffs mentioned earlier. What is evidently clear to me after this track is also how the band has managed to create long-winded instrumental passages that do not even once get boring to listen to. Next up is probably my favourite track off the album, “Descent of the Asheran”, which is a true tour de force in progressive metal prowess. Acoustic guitars enter the scene while a melancholic lead guitar wails away on top as the emotive clean vocals kick in, almost sounding like a sludge metal ballad of sorts. But as you might have guessed by now, this is by no means everything that Dvne has in store for us, and yet again we get a massive punch in the stomach with another brilliant middle section, complete with atmospheric background lead guitars, post-metal vocals and a massive riff if I ever heard one. Again, I am absolutely blown away by how well these sections have been put together, but also by the transitions between them. Even though there are many tempo and time signature changes in this track, the flow never breaks up and it never sounds forced — which is an art in itself when creating progressive metal. After the harmonic instrumental track, “Sunset’s Grace”, and the returning black metal influences on “Rite of the Seven Mournings”, “Edenfall” also stands as one of the highlights of the album. “Edenfall” starts out gloomy and vast, with sustained lead guitars filling the void before developing into a bridge featuring my favourite vocal performance on the album, almost whispering before exploding into soaring and powerful vocal harmonies. It stands as one of those chilling and epic moments before once again descending into the gloom of the intro riff, but now it sounds even more desolate, as it is covered in distortion. The desolation fades as we near the end of this journey. The mastodon (pun very much intended!) of an album finisher, “Scion”, a nine-and-a-half- minute epic and also one of my favourites, starts out with a riff that could have been written by Cult of Luna, all fuzzy and droning. This track in particular seems very inspired by post-rock/metal as there is a great focus on creating a lofty atmosphere with a crescendo focused structure to the songwriting. And Dvne delivers yet again in this regard, through an outro with multilayered guitars smothered in delay, drums pounding away, while a Tool-esque bass line signals repeats in front. This outro is the perfect ending to a wholly impressive album that I think any fan of progressive metal should a least give a chance. It is pretty clear to me that Dvne set out to create a progressive metal album that felt like a journey from start to finish and I believe they have absolutely succeeded in this goal. You might have noticed that I have not mentioned any negatives about this release. That is because I believe there are next to none or they are at least so insignificant next to the sheer brilliance of it all. I must admit, that after repeat listens for several weeks, I cannot call this album anything other than an utter masterpiece and it knocks my former album of the year from 2017 off the top. Jaw-dropping stuff. Listen to it. Now.